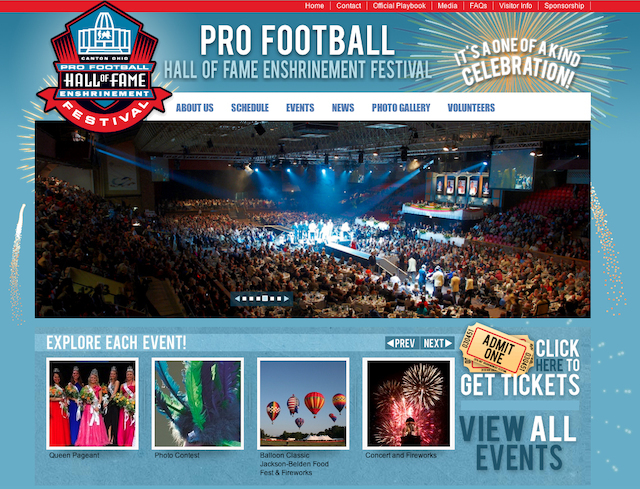 CANTON, OH (October 2, 2012) – The Pro Football Hall of Fame Enshrinement Festival was recently recognized by the International Festivals & Events Association (IFEA) with several Pinnacle Awards, all in categories for events with budgets over $1.5 million. The Enshrinement Festival received a Gold Pinnacle Award for “Best Event Video” and Bronze Pinnacle Awards for “Best Event Website,” and “Best Press/Media Kit.” Awards were presented in 69 different categories, and winners were announced on Sept. 21 at the IFEA/Haas & Wilkerson Pinnacle Awards Ceremony during the IFEA’s 57th Annual Convention & Expo in Denver, Colo. Joanne Murray, director of the Pro Football Hall of Fame Enshrinement Festival, expressed appreciation to Larry Schock and Zachary Piette of PYEcom Home Video, who developed the event video from hundreds of hours of footage shot by the PYEcom team. Annual Enshrinement Festival overview DVDs are available for purchase at $24.95 each, plus shipping, by contacting Joanne Murray at joannem@cantonchamber.org or (330) 458-2050. She further expressed gratitude to Geoff Karcher and The Karcher Group for the Enshrinement Festival’s Website design at www.profootballhofef.com, and to Jessica Bennett, Director of Marketing and Events, and her team at the Canton Regional Chamber of Commerce, for their outstanding design of the press kit. “The Enshrinement Festival is fortunate to work with such creative and talented people who help us share our message: that the Pro Football Hall of Fame Enshrinement Festival is indeed a one of a kind celebration,” noted Murray. The professional competition drew entries from among the world’s top festivals and events with winning entries coming from organizations as varied as the National Cherry Blossom Festival, Washington, DC; Houston Livestock Show & Rodeo, Houston, Texas; Norfolk Festevents, Norfolk, Va.; 500 Festival, Indianapolis, Ind. ; Dublin Irish Festival, Dublin, Ohio; Cherry Creek Arts Festival, Denver, Colo.; and Pasadena Tournament of Roses, Pasadena, Calif. International contenders included such diverse event organizations as Showtime Events, New Delhi, India; World Gourmet Summit, Singapore; Rotterdam Festivals, The Netherlands; Festival Lent, Slovenia; and Shambhala Music Festival, Nelson, BC, Canada. “The IFEA/Haas & Wilkerson Pinnacle Awards Competition recognizes the outstanding accomplishments by festivals and events around the world,” said IFEA president and CEO, Steven Wood Schmader, CFEE. “Striving for the highest degree of excellence in festival and event promotions and operations in every budget level and every corner of the globe, this competition has not only raised the standards and quality of the festivals and events industry to new levels, but also shows how event producers can use innovation and creativity to achieve a higher level of success.” Headquartered in Boise, Idaho, the International Festivals & Events Association (IFEA) is The Premiere Association Supporting and Enabling Festival & Event Professionals Worldwide. In partnership with global affiliates, the organization's common vision is for "A Globally United Industry that Touches Lives in a Positive Way through Celebration.” The Association offers the most complete source of ideas, resources, information, education and networking for festival and event professionals worldwide and can be accessed via www.ifea.com. The Pro Football Hall of Fame Enshrinement Festival entertains nearly 700,000 people at 19 diverse events over two and a half weeks as they honor the induction of football heroes into the Pro Football Hall of Fame in Canton/Stark County, Ohio. Professional staffs at the Canton Regional Chamber of Commerce and Pro Football Hall of Fame and team of more than 4,200 extraordinary community volunteers and sponsors support the summer festivities. Visit www.profootballhofef.com for more information.